Will heavy weights make us bulky? Is cardio the best exercise to burn fat? Not quite says Jean-Claude Vacassin, as he debunks the top five fitness myths. With so many conflicting ideas about the best way to get fit, lose fat and be strong and healthy, it can be difficult to separate the wood from the trees. To help you in the right direction, here are the five biggest fitness myths debunked. 1. Eat less to lose weight: This is one of the most hotly debated areas when it comes to weight loss. A lot of nutritional advice will tell you to simply eat less – but where does it stop? Your body adapts to the conditions you provide it with, and will learn to function on what you give it, so repeatedly reducing your calorific intake will lead to unsustainable weight loss that will leave you undernourished and fatigued. Calories do count, but counting them is often not the most effective way of achieving sustainable weight loss, as different macronutrients have different impacts on the body. Many people eat under their basal metabolic requirements and are lacking sufficient calories to fuel their bodies. This can lead to nutritional deficiencies such as fatigue, poor exercise performance and disrupted sleep, all of which can halt fat loss. A good rule to follow is to eat good quality food which fulfils your own requirements – it’s very difficult to get fat eating vegetables and quality protein. Don’t just think, ‘move more, eat less’; think of optimising your health and fuelling performance, and weight loss will be a by-product. 2. Weights make you bulky: This is a common objection to weight training, but hopefully a myth that is finally being put to bed. The simple truth is, lifting weights is not going to make you bulky unless you make a huge specific nutritional push and spend a lot of time in the weight room, purposely trying to do so. The hormonal conditions necessary for gaining large amounts of muscle mass aren’t present in most of us. Not to mention that we are often well short on sleep and other recovery strategies that are essential if we want to build our bodies. Yes, you might gain some muscle if you train with weights, a small amount, but the effects are positive: improved posture, a trimmer silhouette, structural balance, reduced risk of injury, increased fat loss and an overall increase in your functional strength. 3. Cardio is best for fat loss: There are those that claim that steady state cardio is the best way to get fit and lose weight, and those that wouldn’t go within 10 metres of a treadmill. The right path lies somewhere in the middle; low intensity cardio has its place in a training program, as a base conditioning tool or for recovery from high intensity work and of course for long distance athletes. But for the majority of us, who want to lose fat and become functionally fit and strong, this type of cardio is time consuming, less efficient than interval training and can be tough on the joints. You will burn calories if you run for several hours a week, but you’re likely to burn muscle too. To maximise fat loss, we need to increase our metabolic rate so the number of calories the body burns at rest is increased. The best way to do this is through high intensity exercises, interval training, and lifting heavy stuff. Combine resistance training and cardio for optimum results. It’s about more than just the time you spend in the gym; it’s about rewiring your body so it works for you. 4. Carbs and fat make you fat: Low carbohydrate diets are ‘in’ at the moment, and fat has often been cited as a cause for obesity and poor health. It’s true that cutting these things out of your diet will kick start your weight loss, but this is because doing so will reduce your overall calorific intake, not because these things are intrinsically ‘bad’ for you. Although being at a calorific deficit is crucial if you want to lose fat, cutting out carbs and fat completely is likely to be counterproductive in the long term; the body needs these things for optimal performance. Carbohydrates are an important fuel, especially if you’re working out regularly, and a certain amount of fat is important in your diet to aid fat loss; fat improves cell permeability and signalling, speeding up your metabolism. It’s less about quantity than quality – stick to unrefined carbs that provide your body with essential vitamins, minerals and fibre, like quinoa, brown rice, oats, pulses and vegetables. Avoid processed foods, which are high in calories but relatively nutritionally inferior. Eat good fats like those found in avocados, nuts, coconut oil, nut butters and oily fish, avoiding artificial fats found in things like pizza, margarine and fried foods. 5. Light weights are good for toning: Two things are necessary for ‘toning’ your physique: decreasing your body fat and increasing your muscle mass. 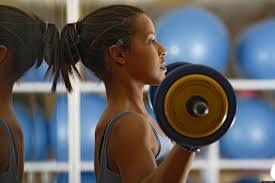 Working out with light weights won’t do a significant amount either; what doesn’t challenge you won’t change you. You need to challenge your body to get the benefits that lifting can bring. I hear people saying, ‘But I don’t want to get bulky…’ Unless you lift heavy, for a lot of reps, at a high volume, and significantly increase your calorific intake, it won’t happen. The key is in the program. And regardless of the weight, ultimately it comes down to diet. Most people simply don’t eat enough calories to lay down any significant muscle – it really is more difficult than most of us imagine. It takes a calorific surplus to build muscle mass, and a deficit to lose fat – it’s difficult to do both at the same time, certainly beyond the first few weeks of training. Like everything, it’s dose dependent: the key is in the execution.